Cricket - Todmorden v Walsden pre-season friendly. Walsden's Joe Gale. 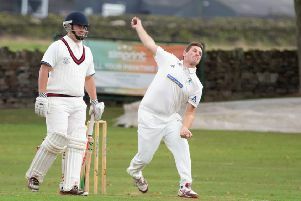 Walsden could only muster nine men for the Bank Holiday Monday’s trip to Werneth in the Pennine League’s T20 - including third teamer Mark Gledhill - but still won by nine wickets. The hosts were 90 for one after nine overs but Joe Gale, carrying a side strain and bowling spin, took five for 16 to limit Werneth to 147 for nine off 20 overs. Ex-first team skipper Chris Dewhirst made 39 not out and pro Umesh Karunaratne 53 not out as Walsden won with 13 balls to spare. Dewhirst was completing a good game, having taken two for 27 off four overs and pouched a fine catch off Gale’s bowling. Lightcliffe’s home Bradford League match against Woodlands was abandoned without a ball being bowled.